The world of Buffy the Vampire Slayer and Angel is an expansive one filled with fascinating characters, from the leading protagonists to bit players who leave a big impression. 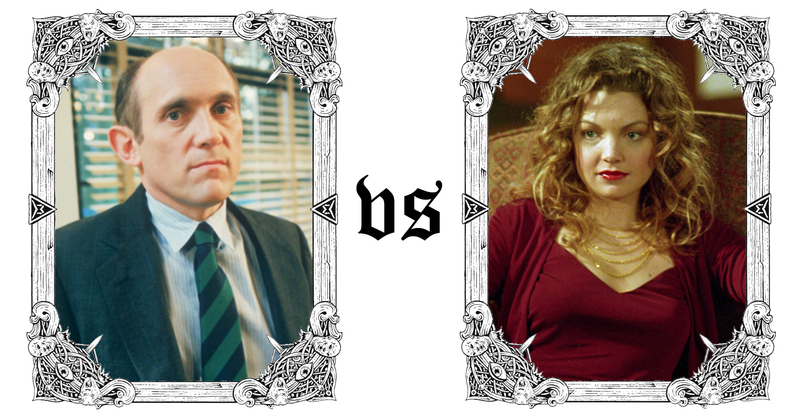 To sort the Slayers from the Slayerettes, Alex, Tim + guest Buffyverse expert Imi Spencer-Dale have bracketed up 64(ish) characters, seeded them based on the number of episodes they appear in, and will be eliminating them one at a time in a knockout-style tournament. Alex: So far, I think every match-up has gone to the character who has appeared in more episodes. I feel like, this month, we’re entering potential upset territory – and that starts right here, because Xander is the very definition of a Problematic Fave. Imi: Before our recent rewatch, I’d have said that Xander is an absolute delightful gem. Not sure whether I just hadn’t noticed how he’s not great to the women in his life unless they’re being perfect, or whether it’s the modern climate making these problems more obvious. Alex: We’ve talked before about the Trio of Nerds, and how they present toxic masculinity in a way that extends beyond traditionally masculine characters. On this issue, Xander feels like the show’s blind spot. Tim: Watching Xander at the time, as a teenage boy myself, I think I probably interpreted him the way the writers intended – as a good-hearted young man who occasionally screwed up. Looking back now, I still think he’s a great character, but he’s very much a boy (and man) with a lot to learn, and his treatment of women is central to that. Imi: I feel like the screw ups aren’t even the worst problem, because characters making mistakes is just storytelling and the whole show is about finding your way as a teenager. It’s when he takes his ‘big moral stands’ that bother me most. The main example being when he’s disgusted by Anya and Buffy for sleeping with Spike, even though neither of them had done anything wrong or hurt anyone else, and he had in fact dumped Anya at the altar a few weeks before. …And I’ve just done a quick Google and been reminded he lied to Buffy about Willow getting Angel’s soul back. Insecure to the point of enabling murder? Not a good look, pal. Alex: So, we’ve pretty thoroughly established Xander’s problems. But, as a dude who grooms young women into lives of violence, pits them against one another and shows them affection until the second they disobey him… is D’Hoffryn free of those same issues? Tim: It’s a very different kettle of demon fish with D’Hoffryn. He’s presented as fairly straight-forwardly evil, and pretty unrepentant about it. I actually like D’Hoffryn a lot. His Season 4 appearance when Willow’s magic is going crazy is a real highlight. Imi: I do enjoy how they used him as more than just Anya’s boss – coming in to tempt Willow, and then in a weird way to comfort Anya post-breakup. And helping scorned women become powerful is an enticing idea. 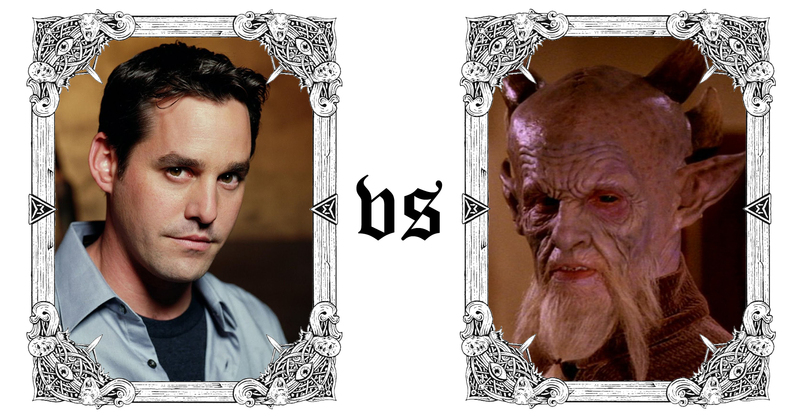 Tim: I enjoy the sort of demonic bureaucrat role he originally seems to fill – empowering vengeance demons because they have to be there, not because he’s particularly evil. I think when he shows up in Season 6 and beyond, and does stuff like killing off Halfrek – pushing him more into straight-up villainy – that’s when he loses his charm. Alex: As we’re picking through D’Hoffryn’s various stages of evolution… It’s kind of shocking to remember that he’s only actually in four episodes, one apiece in Seasons 3, 4, 6 and 7. It’s a good example, I guess, of that classic Buffy trick, spreading appearances across years and mentioning the character when they’re not around, so you get this sense of them existing beyond what you actually see on screen. But, at the end of the day, Xander is an absolutely pivotal character. I have definite issues with him but… maybe it’s just Nicholas Brendon’s charisma, or because I share a lot of reference points with the character, or because he was the character I got to be in the playground, or because our good friend Reece Lipman spends his entire life cosplaying as Xander… but, in spite of myself, I really like the guy. Imi: Eighty percent of the time, he’s what he’s meant to be – likeable and bumbling and caring and a good friend. Tim: Even when he’s not always a good friend or a good person, he’s an important presence, and there are moments when he absolutely shines. Alex: A qualified victory for Mr Harris, then? Imi: I think so – he has a better head of hair, after all. Alex: Both are equally horny, though. Alex: I’m going to lay my cards on the table here right up front: Glory is my least favourite Big Bad in either show. To paraphrase the meme: Change my mind. Tim: I don’t think you’re wrong, even though I really enjoy Season 5. She doesn’t have a lot of symbolic weight to her, beyond being this overwhelming force. Imi: I did enjoy how epically super-strong Glory was. She possibly felt a little more like a movie villain – ramping up the danger and thwarting them at every turn. But I feel like in these sorts of shows you’re often just told how much worse this villain is anything they’ve faced before. With Glory, you get to see it. Admittedly, there’s not much of thematic interest to Glory. No hidden nuances or anything. Tim: Also, he whole brain-sucking element never really gelled with the rest of Glory’s deal. I did enjoy her grovelling minions though. Imi: Having her be quite human was enjoyable – getting cranky and stubborn – and also lulled you into a sense of normality so when she hit, it hit hard. Usually literally. Alex: Meanwhile, he’s not exactly a Big Bad, but… in a show about teenagers’ supernatural adventures, a grumpy school principal is the perfect choice for a low-level adversary who obstructs their mission season after season. The principal antagonist, if you will. Imi: Antagonist feels like the right word for him. Our heroes are dealing with life-or-death situations that they can handle just fine – but back in the normal world, they’re at the mercy of the principal like normal teenagers would be. He’s not a villain, or actively evil, but he can be so frustrating. Tim: Snyder is the perfect kind of obstacle for Buffy, because he’s someone she can’t beat into submission, and to maintain her secret identity she has to show deference, even though her problems are end-of-the-world scale, and his are parents’ evenings and talent shows. Alex: The fact that – despite his connections with the Mayor – he never turns out to be a full-blown threat, or have any spooky powers of his own, makes it even better for me. Tim: Armin Shimmerman is just so perfect as this weaselly little man exerting power where he can, and the moments when you get the hints that he might know a little bit more than he lets on are so great. As satisfying as it was when Buffy stood up to him, it was even more so when Joyce or Giles did. People with authority over teenagers can often be monstrously awful to them in very cruel ways, and seeing proper adults stand up to that is always wonderful. Imi: I’m genuinely not sure which way to go with my vote here. I assumed I’d go Glory, but all this Snyder chat is making me much more nostalgic for his scenes than any Glory storyline. Alex: A final nudge – remember him in “Band Candy”? When he reverts to his younger self, and it’s even more of a square little nerd? Plus, in “Restless”, he has that amazing Colonel Kurtz return in Xander’s dream sequence. I think both of those swing my vote Snyder-wards. And he gets et by a giant Mayor snake! Imi: Oh, that is an excellent end to him. Yep, I’m going with Snyder. Alex: Well, chaps, I did promise you an upset. Imi: Clem is a delight throughout, and a fun complication of the idea of ‘humans good, demons bad’. Meanwhile, Dawn has her occasional moments and she was less annoying on my second watch. But she absolutely nails the ‘annoying younger sister’ and ‘stubborn teenager’ roles, for good and bad. Alex: Dawn is possibly the single most disliked character in all of Buffy. The comparison that gets applied to her is ‘Scrappy Doo’. I’m never sure if that’s fair, but she can certainly be irritating. Tim: I think there’s a certain amount of that irritation that’s intentional, like Imi mentioned, and Dawn is designed to shake up the show in a pretty fundamental way. I think the combination of having her there and Buffy’s mum dying serves to make the other characters feel a lot older than they should when they’re meant to be 21 and 22. Imi: I feel like we just didn’t need everyone dealing with, essentially, having a child? The constant talks of ‘what will we do with Dawn’ and ‘someone’s got to look after Dawn’ get tiring – especially when, before long, she’s the same age they all were in Season 1. 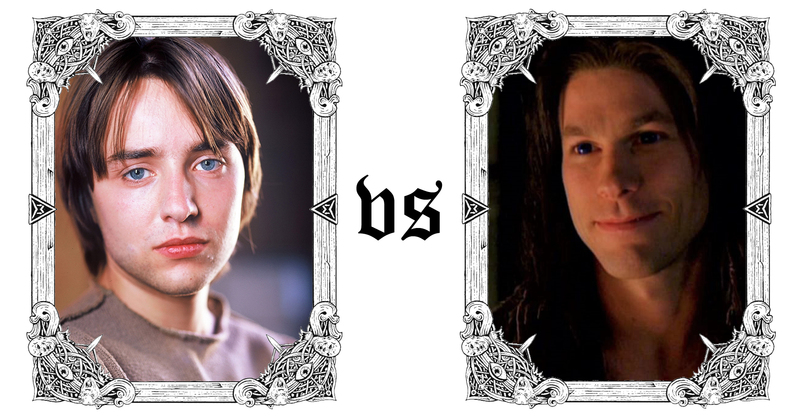 Alex: Dawn’s age is notably inconsistent – I believe she was originally written considerably younger, until they cast Michelle Trachtenberg, by which point the first few scripts were written? They obviously rewrote around that decision, but there are still rough edges. Imi: Also, let’s come back to Imi’s favourite gripe: Dawn was one of the ones who kicked Buffy out of her own house, when Buffy metaphorically and literally gave up her life for Dawn. Alex: And was she contributing to the mortgage, Imi? Tim: Depends. Did she sell any of the stuff from her baffling shoplifting phase? Alex: You know what… I think we’ve actually nailed the problem with Dawn there. She’s given these problems, and has these outbursts, just to present obstacles for Buffy and the prematurely grown-up Scoobies. And when you’re deeply invested in the gang, it’s hard not to resent her for that. Tim: Given that we’ve been pretty critical of her, I do want to highlight one great moment Dawn has at the end of Season 5, when she calls out Ben’s BS and demands he turn into Glory. It’s a really good scene, and very well acted by Trachtenberg. Alex: I also think Dawn’s introduction is a very cool concept. It makes superb use of the form, taking a familiar television trope – the new cast member introduced out of nowhere – and turning it sinister. You’re left to wonder for a couple of episodes: Could she be the next Big Bad? Tim: I’d really like if they had dived more into Dawn’s ‘history’, and the idea of a kid that grew up surrounded by the supernatural but not so thrust into it as Buffy was. The bits in later seasons where she becomes almost like a Junior Watcher were intriguing, but by then we had the Potentials to worry about, and Dawn was sort of pushed off to one side. Alex: I’m really fond of where she ends up in Season 7, as the depowered normal one in the group who (surprise!) handles it much better than Xander. Plus, all the stuff with her own high-school gang gives me strong Season 2 vibes, and I could’ve watched a spin-off show about their adventures. Imi: True, but I think by then I was just a bit like ‘oh, okay, it’s Dawn. Can we have another Willow storyline, please?’ Whereas I was always thrilled to see Clem. Alex: Clem helps to bring out Buffy‘s more sitcom side, providing moments of levity in seasons that desperately need it. With his love of Doritos and telly, is Clem the single best example of the ‘demon who actually kind of likes it here’ archetype? Tim: It’s funny how we get Clem in Buffy and Lorne in Angel as two very different expressions of that. Lorne loves the glamour and sophistication of Earth compared to his home dimension, whereas Clem just sort of feels like a friendly guy who happens to be a demon. Given that Season 6 really ratcheted up the melodrama, and Season 7 was the Most Apocalyptic Ever, it was so refreshing to have a character who was detached from all that, who just hoped everyone was alright and offered a friendly, if wrinkly, shoulder to lean on. Alex: So, is that enough to put him over Dawn, a character who gets way more screentime and is much more pivotal to the plot? Imi: I think it is. Clem definitely deserves to make it to the second round, and I feel like Dawn never quite earned that right. Maybe if she’d contributed to the mortgage. Tim: Dawn has some strong moments and plays a crucial role at times, but I think she mostly feels like unrealised potential, and a plot device that never really gelled into a full-blown character. Whereas Clem jumps off the screen pretty much from the word go, and is delightful in almost every scene he’s in. Alex: I do think Dawn gets too much of a hard time, but she has fairly sharp highs and lows whereas, like you say, Clem burns consistently bright. This one goes to everyone’s favourite baggy-skinned underdog. Alex: It’s worth noting that the appearances don’t count Baby Connor, partly because he’s just a fleshy prop, and partly because I’d feel cruel bringing an infant into what we’re about to unleash. Tim: I’ll trash a baby, I don’t care. When they’re as much of a trash baby as Connor is. Utter garbage boy. Alex: Connor was born in a back alley, surrounded by dumpsters, and that is where he belongs. I mentioned the Dawn/Scrappy Doo comparison earlier, but… Connor is, straight up, the Poochie of the Buffyverse. Imi: Given one of the key things I like about these two shows is the shades of grey, and how villains often come from being narrow-minded and refusing to change opinions… stubborn, grumpy, anti-Angel Connor is set up to be infuriating, surely? Alex: His stubbornness and grumpiness are one thing. As I said with Dawn, I can forgive them because, hey, that’s teenagers (from an adult perspective, at least – it’s obviously very different when the show is from a teen point-of-view). But… well… then they made him sleep with Cordelia, the woman who had been changing his nappies a few months earlier, while his daddy watched from a nearby rooftop. Imi: I don’t think we’ve ever wailed ‘no no no’ so much at a single scene of television. Tim: For all my garbage boy statements, I’m going to slightly come to Connor’s defence here – I think he got almost as screwed over by Season 3 and 4 as Cordelia, in terms of where the plot shoved him. The pure concept of Connor has a lot of legs, but the decisions that the writers forced him into never felt natural or logical, and that means you’re left with a very frustrating character. Alex: That’s fair – but it’s also the vast majority of Connor’s appearances. He is, more than the average character, part of the plot, and I’m not sure you can extricate anything about his concept from the writers’ execution. Tim: I feel like his worst crimes occur in Season 4, when he gets roped into Cordelia’s demon possession/pregnancy stuff. If he’d just been allowed to be Angel’s disaster of a teenage son, he might have come away a bit better. And when he shows back up in Season 5 and he’s not so beholden to the plot mechanics, he’s a much more appealing character. Is the problem that they just keep hitting the same notes? He hates Angel, but Angel loves him, and is sad about it, but then he softens, but then he hates Angel again, and then Angel is sad because he loves him. Tim: I think so – there’s very little sense of him growing or learning anything during his time on the series. And he has an awful haircut. Alex: I actually quite like Dad Angel, is the thing. It’s a sweet and different side to the character. But what he sees in this garbage boy, I do not know. Imi: And then, in the other corner, we have the lovely Groosalugg – the sunshine to Connor’s perma-raincloud. He’s happy, he’s enthusiastic, he loves the real Cordelia (not possessed Cordelia). Tim: And his eyes are so blue! Imi: Anyone got a bad word to say about Groo? Tim: Just that he isn’t around nearly enough. Imi: Anyone got another 75 bad words to say about Dumpster Grumpster? Alex: Then it is decided! Let us all do the traditional Dance of Joy for our beloved, blue-eyed champion! 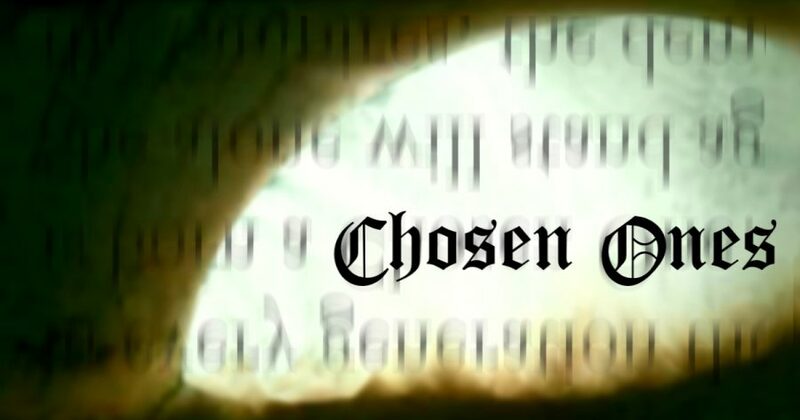 Next time on Chosen Ones: Two slayers, two witches, two Woods, and possibly the easiest decision yet. Plus the Chosen One herself, Buffy Goddamn Summers, enters the competition. Like what we do, and want to help us make more of it? Visit patreon.com/timplusalex and pledge to gain access to exclusive blogs, ebooks, mixtapes and more.